Probably the easiest way to travel between Bangkok and Koh Mak or Koh Kood is by private transfer by car or minivan. 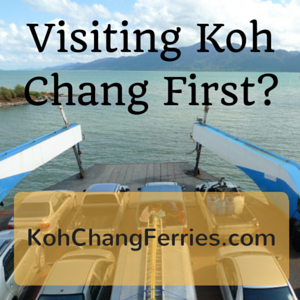 But unlike Koh Chang, there aren’t any vehicle ferries to these islands. You will have to take a passenger boat from the mainland. This is a door to door service from hotels in central Bangkok areas, Suvarnabhumi Airport and Don Mueang Airport runs to the mainland piers at Laem Ngop and Laem Sok. Passenger boats to Koh Mak leave from Laem Ngop and anyone going to Koh Kood will be dropped off at Laem Sok. Flying to Trat Airport takes under an hour from Suvarnabhumi and is the quickest way to get to Koh Kood or Koh Mak. However, as Bangkok Airways own the airport and operate all the flights, prices tend to expensive. Especially when compared to the prices for budget flights from Bangkok to the north and south of Thailand. Expect to pay 2,500 – 3,500 Baht per person during high Season. Plus transport from central Bangkok to Suvarnabhumi and transport from Trat Airport to the mainland piers. The cheapest options are buses and minibuses, but they can be slow and don’t always go directly were you want to go. If you are going to Koh Mak then there are a couple of buses that will drop you off at Krom Luang pier for speedboats to Koh Mak. But most people will have to either take a pick up truck taxi from the ferry piers for Koh Chang or trat bus station to Krom Luang pier. And if you are going to Koh Kood it’s more of a hassle. As the last boat to Koh kood is mid afternoon, many people who are travelling by bus will have to stay the night in Trat. As they won’t leave Bangkok early enough to make the last ferry. A private transfer by car or minibus, will ensure that you can get to the islands the same day. With no need for a night in Trat town or having to hop on and off buses and pick up truck taxis. 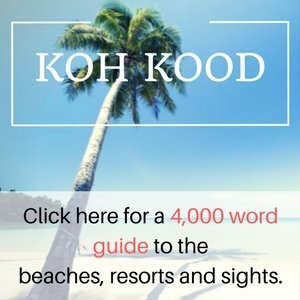 How Long Does It Take to Get to Koh Mak and Koh Kood? From the centre of Bangkok to Krom Luang pier (for Koh Mak) is around 5 hours. 30 minutes less if you are coming from Suvarnabhumi. 30 minutes more if you are coming from Don Meuang. However, this does depend on traffic in Bangkok and road conditions on the way. Plus how often you decide to stop for a break during the journey. If you are going to Koh Kood, add on an additional 30 minutes driving time to Laem Sok pier which is located on a peninsula south of Trat town. We have lived on Koh Chang since 2003 and have been arranging transfers since 2006. The drivers are mostly based on Koh Chang and many have worked with us for over a decade. The standard of English may vary, but the drivers are trustworthy, safe and polite. The private minivans used are Toyota Commuter minibuses, best for 3 to 7 people with luggage. In the majority of cases, the private cars used are Toyota or Honda models suitable for 2 Adults for 2 Adults and a young child. Prices include tax, driver, gasoline and expressway tolls. Boat tickets to Koh Mak or Koh Kood aren’t included. These can be bought when you arrive at the mainland pier. Timetables are on the homepage. For transfers by minivan, additional passengers are charged 100 Baht per person, to a maximum of 7 passengers per minibus. * Note that cars are usually used for transfers for two passengers. But on busy occasions a van might be substituted at no extra cost. If you specifically want a car, please let me know when you book. ** Infant’s or Children’s car seats are 200 Baht each. Maximum of Two per vehicle. Simple. Please use the form below to send an enquiry. I will reply, usually within a few hours, to confirm the availability and price. Then if you decide you book, just let me know. How would you like to pay?Pay in cash on the day or in advance? Copyright © 2019 Koh Kood Ferry Timetables. Powered by WordPress. Theme: Spacious by ThemeGrill.